French trainer Criquette Head-Maarek celebrated her fourth victory in the Electrolux Cheveley Park Stakes when Special Duty put a up a classy performance to gain the Group One prize in 2009. Head-Maarek’s previous winners were Ma Biche (1982), Ravinella (1987) and Pas De Reponse (1996). The first two of those winners went on to victory in the 1000 Guineas the following spring. The Hennessy filly was always in a handy position under Stephane Pasquier and saw off challenges from both 11/8 favourite Lady Of The Desert and then Misheer to record an authoritative two and three-quarter length victory. The winner runs in the colours of Khalid Abdulla and was returned at 3/1. Head-Maarek said: “She proved herself today and Stephane rode a great race on her. “At Deauville (when she finished second to the colt Arcano in the Group One Prix Morny) she went too fast and today I told Stephane to wait as long as you can. She settled well today. “She was going away at the end and I hope we can come back here next year for the Guineas. Good horses make good trainers! “If I had to compare her to my other winners of this race I would say she has the heart of Ravinella, the class of Ma Biche and the physique of Pas De Reponse. “Nothing can come close to her in the yard. She has lots of speed but stamina as well. “Next year is next year however. She is finished for this year. 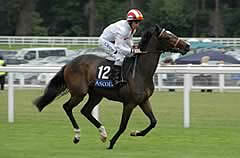 Special Duty’s victory today pushed her to the head of the betting for the 2009 Stan James-sponsored 1000 Guineas. Prices available include 5/1 totesport & Sky Bet, 11/2 (William Hill), 6/1 Paddy Power, 8/1 Boylesports & Ladbrokes. Misheer’s exploits in the Irish Thoroughbred Marketing Cherry Hinton Stakes and the Queen Mary Stakes at Royal Ascot led trainer Clive Brittain to believe she was the best filly in England and her runner-up finish to Special Duty in the Electrolux Cheveley Park Stakes have done nothing to change his mind. The ever ebullient Brittain said: “I said the one that beat us would win and that’s exactly what has happened. Brittain, who also fields multiple Listed winner Nasmiah in tomorrow’s Kingdom Of Bahrain Sun Chariot Stakes, is enjoying a wonderful season, particularly with his distaffers. He added: “You get the odd filly doing a u-turn on you but in the main they’ve run right up to the mark and today it’s taken one from abroad to beat Misheer. I said she was the best filly in England and she’s proved it today. Misheer is likely to head for a well-deserved winter break now before being prepared for next season’s stanjames.com 1000 Guineas. “She deserves a break - she’s had a really good season from Ascot onwards,” said Brittain.